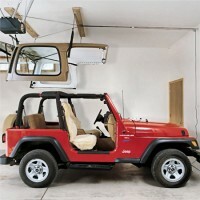 Is your garage filled with so much clutter there's no room for your vehicle? Maybe you're running out of space in your workshop? Looking for creative home storage and organization ideas? Wondering how you're going to fit your new (fill in the blank) in your garage? We have a storage solution for you: Go Vertical! 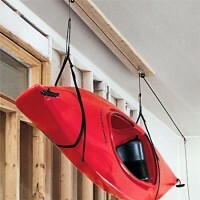 Harken Hoisters provide the answer to all kinds of storage problems by lifting and storing items overhead. Harken Hoister Pulley Systems are easy to install and operate regardless of size or strength. Whether you are looking to store a bike, jeep top, truck cap, canoe, kayak, or just some miscellaneous clutter, we have the right lift for the job. Our pulley storage systems are high quality, durable and have a patented self locking mechanism you won't find anywhere else. 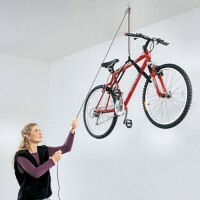 Harken Lifts can be mounted on the ceiling virtually anywhere you need storage space. 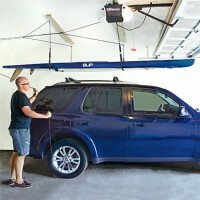 Park your car or truck underneath and lift and store your boat, bike, jeep top or truck cap right from your vehicle. Elegant and simple solution for your garage or workshop. Also works great for in home storage, even apartments if you have high ceilings. Superior to racks, hooks, wall mounts, garage hangers, shelf storage or other organizer options because a pulley hoister allows you to take advantage of previously unused ceiling space. Our hoisters can accommodate ceiling heights of up to 16 feet. We have 1 and 2 point Hoists available for smaller items and 4 point systems for larger items and loads of up to 200 pounds. Please see our online videos below (more in the videos section) for examples and storage tips for using a Harken Lifter. We offer free same day shipping on orders over $50. Please feel free to contact our expert online support if you have any questions. The Harken Hoister is the best bike storage accessory you'll find. Works for all types of bicycles (..